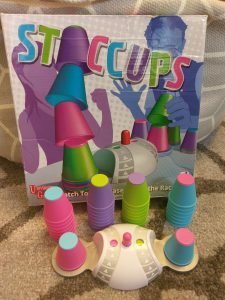 Staccups is the fast-paced game for 2-4 players aged 8+ where you race your opponents to be the first player to stack all your cups – that sounds simple doesn’t it, however, it isn’t that easy you have to match the top of the bottom cup with the base of the cup you are putting on top of it. And if you get it wrong your opponents get the chance to challenge you. If the challenge is correct they get a free go but if it’s an incorrect challenge then you get a free go. 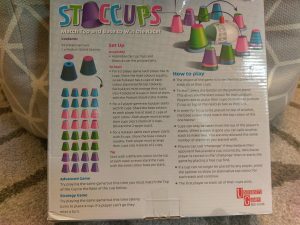 It is worth noting that before your first game you have to assemble the cups by attaching the coloured tops to the coloured bases, There is a picture guide that you follow for this. The object of the game is to be the first player to stack all of their cups. Players can call ‘challenge’ if they believe their opponent has placed a cup incorrectly. colour for each stack and continue. The first player to stack all their cups wins. 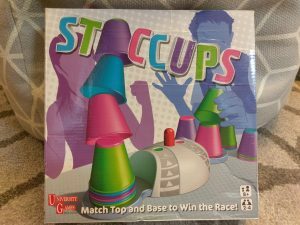 Staccups is a lot of fun to play, it can get very competitive very quickly. It takes a minute or 2 to learn how to play and then the playing time is only around 5 minutes so is a great game for those times when you haven’t got a great deal of time available but just enough time that you need to kill some of it. There are a few irritations I have about the packaging of the game, the game itself is quite small and doesn’t take up much space at all, in fact, it could quite easily fit in your hand luggage for a plane journey, however the box is quite large and took up a lot of space on our game shelf. secondly you have to attach the tops to the bases before your first game, there is a diagram to follow to ensure the correct bases have the correct tops, but the fact you have to assemble it yourself seems a bit pointless, it doesn’t take up any less space in the box so that’s not the reason for having to assemble them yourself. Other than those 2 irritations I have no other complaints about this game. This entry was posted in Board Games, Kids, More, Review.